The hubster and I do not go all out for Valentine's Day, but I do like to treat him to a special meal. While last year's post can be found here, I wanted to share the menu, along with a great recipe. 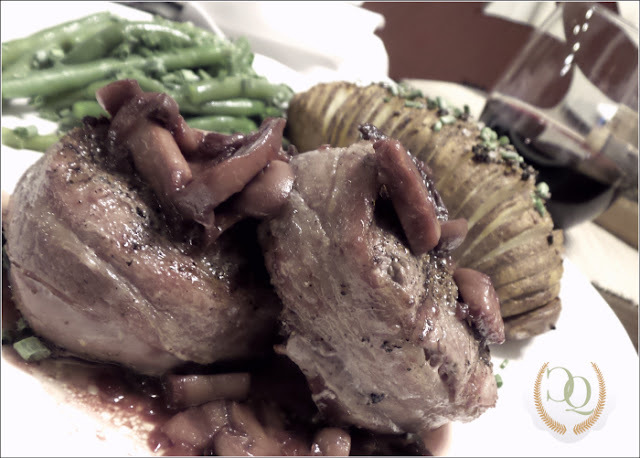 The menu for last Valentine's Day was: Grilled Filet Mignon with Mushroom Red Wine Sauce, Garlic Hasselback Potatoes and Haricot Vert Green Beans with Garlic and Olive Oil. This meal was wonderful, but the prize dish was the Grilled Filet Mignon with Mushroom Red Wine Sauce. Connie, one of my dearest friends, saw it on Food Network's The Kitchen and shared it with me. 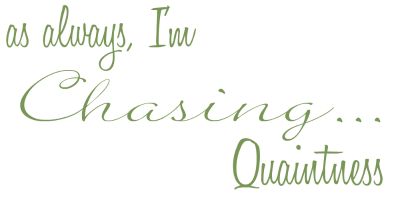 So now, I am paying it forward and am going to share it with you! It's a win/win for all of us! Now, before you begin thinking the filets are too expensive, they are actually quite affordable. You can purchase two for a little over $8.00 at Walmart. And, this is not something you will have all the time...it is one of those "treat" meals. Generously season each side of the steaks with salt and pepper. Let stand at room temperature about 20 minutes before cooking. In a cast-iron (or other heavy-duty) skillet, heat 1 tablespoon of the butter over medium heat. Add half of the shallots and saute until tender for a couple of minutes. Stir in the mushrooms and cook until the water has evaporated, about 5 minutes. Season with salt and pepper. Transfer the cooked mushrooms to a dish and set aside. Wipe the skillet clean. Heat another tablespoon of butter over high heat in the skillet. It will bubble and foam, and after it stops, add the steaks. Sear on each side for about 4 minutes. Transfer to a plate and tent with foil. Reduce the heat to medium high. Add the remaining shallots and saute for 1 to 2 minutes. Turn the flame off and add the wine. Turn the flame back on to high, bring to boil and let reduce by half. Whisk in the remaining tablespoon of butter. Stir in the reserved mushrooms. Instead of using a skillet, the hubster grilled our steaks and I prepared the sauce in a small pan. The hubster is a master grill-man, so the steaks were perfectly done. I was hoping it was you missing and not me! lol! Looks like mighty good eating! Too bad about the internet. that is like lucy without ethel! that is like lemonade without sugar! sorry your internet has been down! The meal looks tasty! Sounds wonderful! I was surprised when you said to get them at Walmart, but if you say so, then I will try it!! What a delicious meal! I have never tried those potatoes but keep meaning to. So good to see you back, missed you, Benita! What a gray messy day we've had here, haven't we? Better ones coming! Yum...this is making my mouth water with just the thought of this delicious steak. I can't wait to try it. Thanks so much for paying it forward sweetie. Hugs!!! 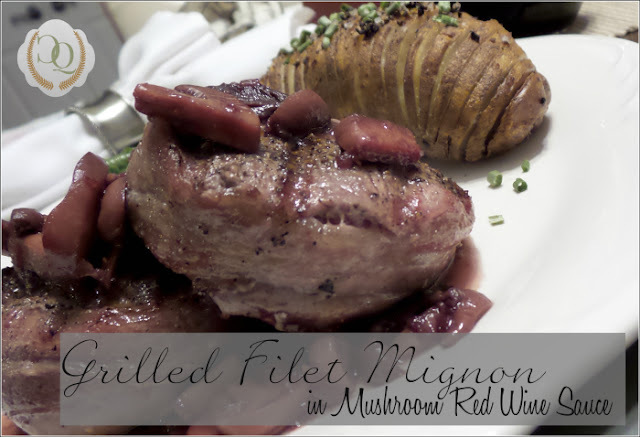 "GRILLED FILET MIGNON with MUSHROOM RED WINE SAUCE"
Oh my, this looks outstanding!! And what is with the internet????????????????? I love a good filet mignon!! Always a treat! Oh my, can I come next Valentine's Day. Yummy!! We have had the BUG here, an awful flu. Finally getting on the mend today.